Dreamer’s Delight was one of at least 5 or 6 different organic herbal tea mixes that one of my good friends designed and sold at the campus of Sir Sanford Fleming in 2010-12, where I went to college to study ecosystem management. I briefly took up the tail-end of this limited time endeavor and sold many-a-remedies to the students on campus and beyond. Despite greatly enjoying my time at college and coming out of it with quite a brand new outlook on pretty much everything and many hopefully life-long relationships, my attitude towards the program’s name has soured a smidgen. Ecosystem management? That’s a little conceited. I highly doubt we can consider ourselves curators of the forces that have shaped us into what we are today, both as individuals and as a species. We can certainly act upon the environment in both positive and negative ways, however I find that these methods of describing and articulating the natural world are highly subjective regarding their outcomes. We can make a difference, that’s for sure, but I personally think it’s inappropriate to substitute ‘management’ in place of ‘subjective alteration’. Dreamer’s Delight is a mixture of more or less equal parts of the following herbs: mugwort (Artemesia vulgaris), chamomile (Matricaria chamomilla), catnip (Nepeta cataria), rose hips (Rosa sp. ), peppermint (Metha x piperita), ginkgo leaf (Ginkgo biloba) and valerian root (Valeriana officinalis). As an herbal tea, the flavor is quite complex and floral, but also deep and bitter if left to steep long enough. I am hoping that this earthy bitterness will compliment the more mild English Fuggle hops that I added throughout the boil along with the tea but be sharpened by the more pungent Cascade hops added 5 minutes from the end of the boil. There is quite a lot to be said about the medicinal and therapeutic properties of all the herbs featured in Dreamer’s Delight, so I’ll try to keep it short. Peppermint is a classic stomachic and digestive aid but is also great for treating respiratory congestion and sore throats. The leaves of the ancient ginkgo tree have become one of the most studied herbal medicines of all time, and are confirmed to improve circulation, enhance brain function and cognitive abilities and have the potential to possibly treat or prevent neurodegenerative diseases such as Parkinson’s or dementia. Rose hips are gently sweet and nutritious, containing more vitamin C than oranges or apples. Chamomile is a very well known and respected sedative and nerve tonic, but it is also a potent antiinflammatory and antispasmodic. The roots of valerian are strongly pungent scented and in addition to be being wonderfully sedative and digestive are a nervous system depressant, helping to recover those inflicted with insomnia and the debilitating effects of chronic stress and anxiety. Catnip leaves and flowering tops encourage relaxation and sleep and also act as tonics upon the nervous and digestive systems. The addition of mugwort herb is what makes this herbal recipe even more intriguing. This robust and aggressive perennial bearing wispy, finely laced and silvery-sided foliage from long, arching branches is a native of Europe that is thoroughly saturated in both favorable and hateful folklore. It’s chief medicinal properties reside with the herb’s bitterness, which aids in digestion by stimulating the excretion of digestive enzymes from the liver and gallbladder. Tannins, which are responsible for the bitter taste, also act in the stomach and intestines to tone and strengthen inflamed, swollen or ulcerous tissues. This same restorative property is transferred to the uterus, where it reduces inflammation and excess bleeding that is sometimes associated with menses. If taken on a regular basis, mugwort acts as a tonic to the female reproductive system; restoring regularity if absent and reducing pain. In addition to all this, mugwort has a widely varied effect on our ability to dream. Some individuals report after drinking a cup of mugwort tea that their ability to recall dreams improved, sometimes lasting for up to 2 weeks after drinking the tea. The lucid quality of dreams was also affected; some users admitting that they were better able to control or manipulate the outcome of the dream in which they were experiencing. Alternatively, some users reported no affect on the quality of their dreams whatsoever. The potency of mugwort on this feature of our sleep patterns is remarkably complex and may never be adequately understood, but it is certainly curious and fascinating in it’s actions and most certainly has the potential to enhance an individual’s perspectives and appreciation of life through dream exploration. All the better if this medicinal property, as well as all the others, is translated over to the fermented version of this herbal ensemble. Note: This time around, I decided to add the majority of the ingredients to the boiling wort gradually, which will hopefully result in a wide and complex extraction of both the bitter tannins and lighter, delicate flavors and aromas that are quickly boiled off. Bring approximately one gallon of water to a boil. Once boiling, remove from heat and add liquid dark barely malt extract, stirring until thoroughly dissolved. Bring back to a boil, set timer for 30 minutes and start. Immediately 20 grams of Fuggle hops and 1 ounce of Dreamer’s Delight herbal tea, adding the same amount of both ingredients at 20 minutes left in the boil and again at 10 minutes left in the boil. At 15 minutes remaining in the boil, add the Irish moss tablet and stir until completely dissolved. 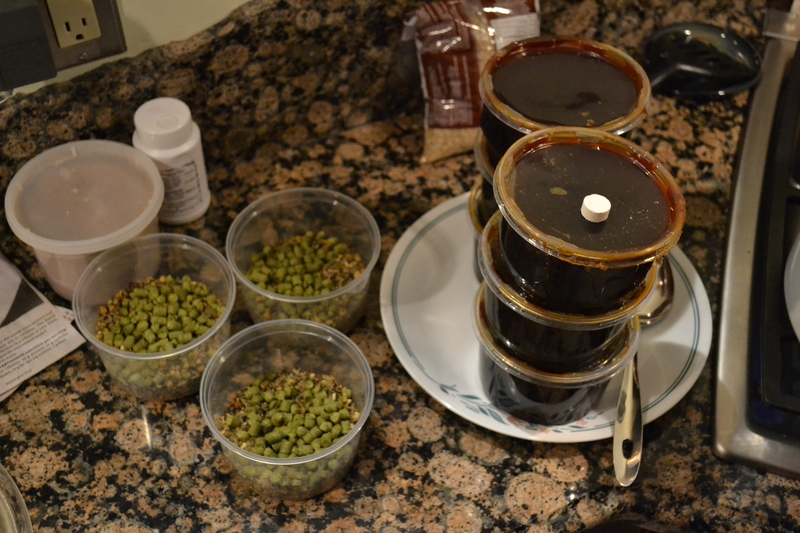 At 5 minutes remaining, add the 10 grams of Cascade hops. Remember to stir occasionally to prevent the malt burning and keep the herbs and hops in suspension as they tend to float on the surface. Once the boil is complete, remove from heat and stir in last remaining ounce of Dreamer’s Delight. Place in a preferably cool or cold location (such as outside if it’s winter like it is right now) and allow the wort to cool and steep until at least 120-100° F. Now strain the wort into your fermenter* about a quarter gallon at a time and alternating with the addition of room temperature water. This will allow the wort and water to best mix together. 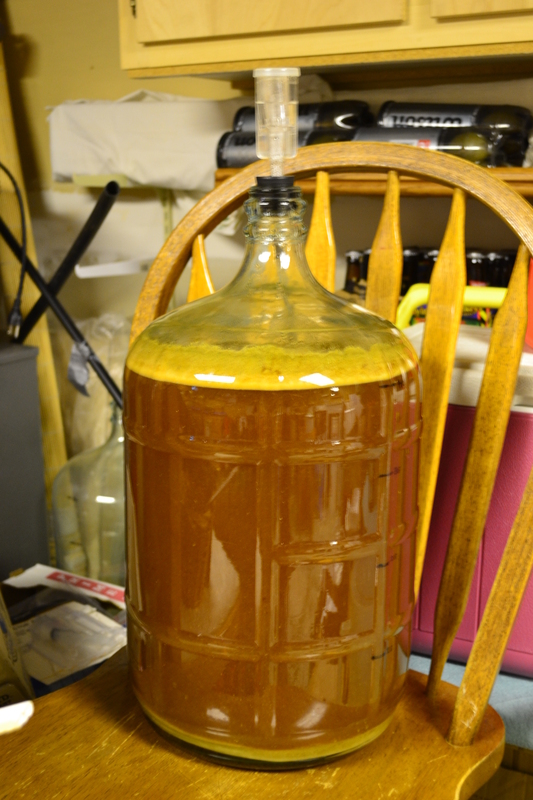 Once a level of 4 gallons is reached in your fermenter, pitch the yeast and insert airlock. * In hindsight it would have been a brilliant idea to place all of the tea and hops in a muslin bag that hung inside of the boiling wort, because trying to strain out all of that tea and hop ‘tailings’ when transferring everything into the fermenter took forever, was embarrassingly messy and an overall miserable experience at best. So I would highly recommend investing in the muslin bags. they aren’t very expensive and if you feel like cleaning them out afterwards they are somewhat reusable for at least 1 or 2 more batches before they get incredibly nasty and taint the flavor of beers that have contrasting flavor profiles. Or, you could be creative and improvise with some sort of giant tea strainer.